MK Robert Ilatov (Yisrael Beytenu) said that legislation to strip MK Hanin Zoabi of her Israeli citizenship would soon be introduced. MK Robert Ilatov (Yisrael Beytenu) said Sunday that legislation to strip MK Hanin Zoabi of her Israeli citizenship would soon be introduced. Ilatov slammed Zoabi for her equation of the IDF with ISIS, the Islamic State, which has conquered large portions of Iraq and Syria. In an interview Sunday on Channel Two, Zoabi said that the IDF was actually worse than ISIS. “The Islamists kill one person at a time with their knives, but the IDF kills dozens of Palestinians with the push of a button.” IDF pilots who flew over Gaza and “pushed a button that released missiles that killed hundreds of Palestinians is no less a terrorist than those who behead others,” she said. Zoabi has been extremely outspokenly critical of Israel and its institutions on many occassions, and has raised the ire of Israelis and their political leaders many times. Over the summer, Zoabi said that the kidnappers responsible for the abduction of murdered Israeli teens Eyal Yifrah, Naftali Frenkel, and Gilad Sha'ar are "not terrorists. They have seen no other way to change their reality and they have to resort to these measures until Israel sobers up a bit and feels the suffering of others." Zoabi also participated in the 2010 Gaza flotilla, and was videotaped standing in front of armed militants and trying to prevent injured Israeli soldiers from being evacuated. 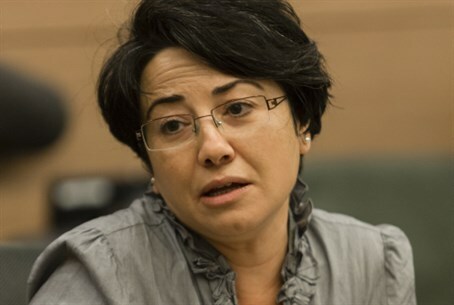 Numerous proposals have been made to ban Zoabi from the Knesset, throw her off Knesset committees, and the like – but Ilatov said that his proposal has the votes needed to throw Zoabi out of Israeli society altogether. “Zoabi continues to ally herself with Israel's enemies,” he said. “She will not remain out of reach of the law forever. Our proposal will remove her citizenship from her when it is passed. Until then, I will do everything in my power to ensure that this traitor will have to find another job,” he added.